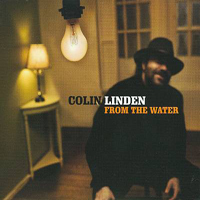 From the Water is another in a series of Colin Linden albums that show he's as talented an artist in his own right as he is a producer and sideman for dozens of others. This record could not have been dedicated to anyone else except our beloved brother, Richard Bell. You are in every note always, and we will forever try and conjure your spirit. Thank You Geoff Kulawick for making this happen. Thanks so much to Gary Craig, who has been such a huge part of my music and life for the last 25 years, and John Whynot, who has pushed it past the point of chaos for even longer. Thanks to the great, unsung alien hero Johnny Dymond, and thanks to man of constant kindness, Bryan Owings. Thank you Brian for your brotherhood and superior rendering. Three of these songs appear in dramatically different renditions on the album, “Sugarbird” that I made with Paul Reddick. I think of these records as being different reflections of the same piece of time. I hope you check “Sugarbird” out as well. Please help rid this world of multiple myeloma.